Jerry Miksch, David Tredwell, Dan Deter and Daniel Davis discuss a conflict situation at the Agile sessions at DELTA. Katie Bean, Laurie Gyalog, Lou Harrison, Jeff Webster and Merranie Zellweger each attended the conference with specialties in mind such as project management and software development. 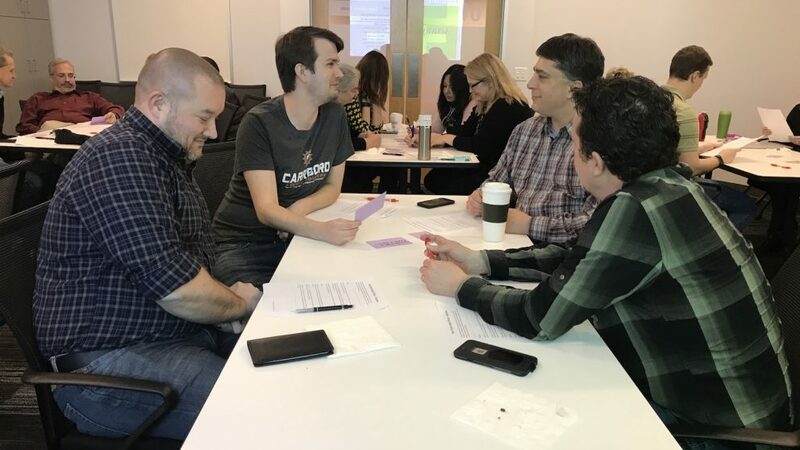 The team facilitated a five-part workshop series focused on each of these specialties with sessions on communication, moral foundations, conflict, DevOps and leadership. The first session kicked off with an overview of Agile philosophy and its benefits without being a fully Agile organization. Agile is the ability to create and respond to change in order to succeed in an uncertain and turbulent environment. Agile is more of a philosophy than a process and is not just for software. It is flexible and adaptable with goals of improving communication, collaboration, innovation and efficiency while supporting iterative development and rapid delivery. 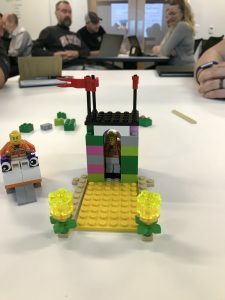 After explaining the basics of Agile, participants collaborated with colleagues at their table to build a shelter out of legos with the following requirements: must have a roof, at least one entrance and the lego minifigure must fit within the shelter. The goal of the activity was to meet the minimum requirements and present a working structure with an emphasis on form and function. Groups built many variations of the structure, from elaborate shelters to simple and functional. After building, the shelters were put to the side to be revisited later in the session. The session focused on how each Agile value relates to DELTA’s teams and processes. With individuals and interactions, Zellweger emphasized leadership happens at all levels with many cross-functional teams. To reflect on the activity, Zellweger directed the group to revisit the shelters and think about a Minimally Viable Product approach that has an emphasis on form and function while meeting the requirements. 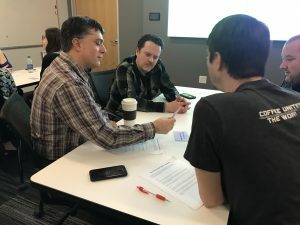 Teams discovered they often overbuilt the structures in the initial round and if asked again, would simply meet the minimum requirements for the first iteration, honoring Agile practices. This session was focused on how an individual’s moral foundations impact their daily decisions and interactions. Zellweger started the session by explaining that we sometimes don’t see ourselves and the world as they really are. We base all of our decisions, interactions and arguments on our moral foundations, which tries to explain the origins of and variation in human moral reasoning. Care is related to our long evolution as mammals with attachment systems and an ability to feel (and dislike) the pain of others. Fairness is related to the evolutionary process of reciprocal altruism. Loyalty is related to our long history as tribal creatures able to form shifting coalitions. Authority is shaped by our long primate history of hierarchical social interactions. Sanctity is shaped by the psychology of disgust and contamination. Since we talk to each other based on our moral foundations, and everyone’s values are different, it makes sense that conflicts and arguments occur. Shift the conversation from opinions to experiences. Facilitated by Gyalog and Zellweger, this session focused on steps to improve communication in conflict, which can be different for each person. Stressful conflict was defined as any statement or action that violates trust or safety. The goal is for stressful conflict to be turned into constructive conflict and engage in conflict effectively. Not only will the ability to work well with stressful conflict strengthen your team but it will improve the health of individuals on your team, create possibilities and foster innovation. Participants took a quiz to better understand themselves under stress to be able to handle it more effectively. In addition, groups were given note cards to see what style of stress was shown. The goal of the activity was to be more aware of yourself and also to focus on the words and body language of others. Dan Deter (left) and Daniel Davis (right) discuss the conflict situations. Stay or walk away: if the situation feels unsafe, walk away and follow-up later or stay and commit to the conversation. Maintain mutual respect: Disrespect comes from noting differences, respect comes from finding similarities. Sometimes you make a mistake and must acknowledge and apologize when appropriate. Replace “you” language with “I” language. 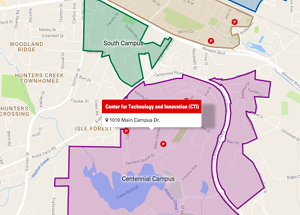 Chris Knotts from ASPE’s Techtown Training Lab discussed DevOps in the context of real-world organizations. Reduced lead time for changes. Faster recovery when problems occur. More robust and better-integrated security. Fast feedback loops and effective communication between teams and department. A “shift left” in batch size, speed and quality — quality of code, testing, architecture, “deployability,” culture. View the presentation to learn more. This session was focused on David Marquet‘s tips for leadership at all levels. Marquet has experience as a U.S. Navy Commander and once was assigned captain of a nuclear submarine. He was reassigned to a different ship with two weeks notice. He noticed there was a problem with the environment of “barking orders” because his crew would listen to the order even if it was incorrect. People feel valued and are proud of being a part of something bigger. People know the organization’s goals and thoughtfully contribute. People feel inspired by pushing control and decision-making down the organization. People take responsibility and have the authority to rise to the occasion, even during times of change. Marquet gives one-minute videos for how to become a better leader at any level called leadership nudges. During this presentation, a few leadership nudges were shown that related to DELTA and its members. Asking for progress, not just the completion status of a project. Say tell me about, not just tell me why. View more leadership nudges on David Marquet’s website. 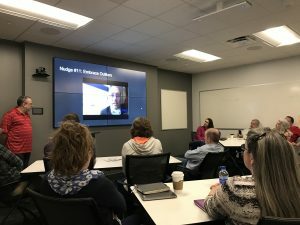 This year, a group of DELTA staff is heading back to Agile in August 2018. Gyalog, Bean, Zellweger, Samantha McCuen and Janna Martin will attend and we look forward to them sharing what they learn with DELTA staff this fiscal year.